These circuits are based on CD40xx Chips and other. You can use 74HCT or any other series that is available. use one family for a particular project. These were used nearly two decades ago. Use it for learning, glue logic or to interface your uC designs to external devices. 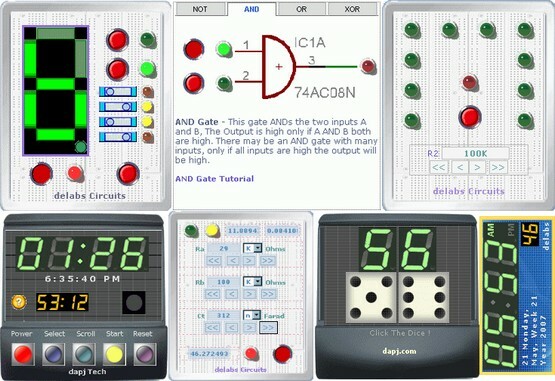 Learn digital circuits by using these Interactive Widgets, operation of logic gates, counters, timers. These were made by delabs long ago for the websites. It was then packaged for iGoogle. 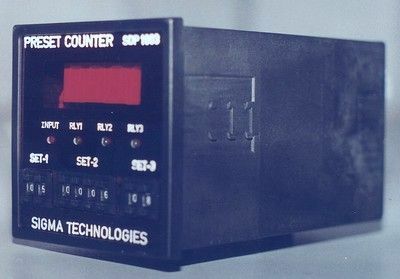 This is a prototype of a Preset Counter. It is built with ICM7217. The cabinet is ABS Plastic DIN 96-96. The Panel is Engraved on Acrylic. I don't remember for which application it was used. It has three thumbwheel settings, when the proximity switch counts upto the set-value, the corresponding relay turns ON, with a State Indicating LED on front panel. These can be configured sequentially or to work synchronously, this depends on what customer wants. Both modes may give the same result. In sequential operation, Some of these counters-timers may need to wait for an external trigger or feedback from a limit switch or another process like pressure alarm. Then more Input options may have to be provided. Counters, timers, analog-process and its interconnectivity makes up the various process loops or chain-reactions in Machine control. The various types of sensors for measurement and feedback of analog and event parameters, monitor the mechanical system and communicate the data to the process instruments. The Actuators like Drives, Solenoids, Pumps, Valves and Heaters act in accordance to the commands of the control system. This regulates and manages the process or machine to deliver consistent and repeatable yield of the end product. Pulse width modulation using 555.
fixed frequency variable duty cycle 555. 555 watchdog for uC and uP systems. OR gate with two 555. Drive SCR thyristor with 555. The documents, software, tools and links are provided to enhance the ability of an electronics student, hobbyist or professional by sharing information. The information, links etc. should be used by the website visitor, at his or her own risk and responsibility. There may be concept, design and link errors in the pages. Creative Work, ideas and documents of delabs can be used for Product Design and Development by R&D Engineers, Hobbyists, Students and even firms for creating useful products. These cannot be used for reprint, replication or publishing online or offline.